Siquijor is the third smallest province in the Philippines and is associated with mystic traditions. It was originally called Isla del Fuego or Island of Fire by the Spaniards who first sighted it in 1565 because of the eerie glow the island emitted due to the large swarms of fireflies on the island. I have heard of stories about witchcraft and sorcery that’s been said to be practiced on the island. But when I visited Siquijor, all I saw was the clear blue water and the pristine white sand that enveloped the island. There were a lot of local and foreign tourists too. We took a ferry from Dumaguete to Siquijor. We bought tickets at the port on the day and took the 7am trip. Upon reaching the island we met a tour guide on the port, Kuya Irvin, that offered us a day tour of the island for only 1,000php. We decided to take the Day Tour since we weren’t familiar with the island. But if you know your way around Siquijor, another option is to rent a motor cycle at the port and use that to drive around the island. The rental rate is just 350php for the whole day. This 400-year old Balete tree is believed by locals to be enchanted. It’s the said to be the oldest and biggest Balete tree in Siquijor. Water flows out from the roots of this massive tree and pools around it. Aside from admiring this majestic force of nature, you can also sit on the edge of the pool and enjoy a fish spa for only 5php. It’s a huge contrast to the 250php I paid for my fish spa in Ocean Park. Initially, it feels very ticklish but then you get used to it. From this spot on the island, you can see Crocodile Island. It’s named as such because from this vantage point, it seems to take the shape of a crocodile. At the suggestion of Kuya Irvin, we had our mandatory jump shot with Crocodile Island in the background. This is said to be the oldest church in Siquijor. It was built in 1887 making it more than 100 years old. According to our tour guide, the stones used to build this church have never been replaced. That’s something to be said about the architecture of this edifice! 129 years and still standing. Not bad. One of my favorite stops on the island was Cambugahay Falls. It takes you about 100 steps to reach the bottom. 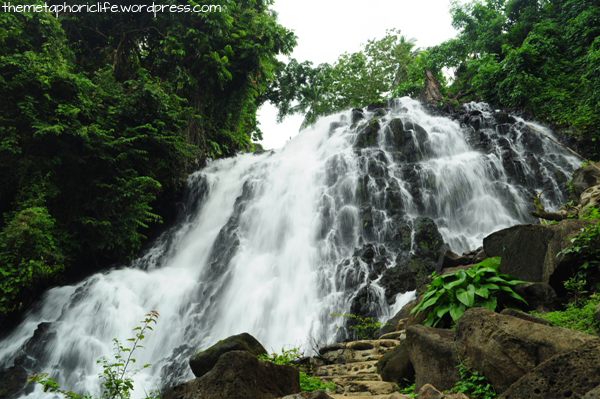 Coming from the City of Waterfalls – Iligan City – I’m hardly amazed by other waterfalls that I see. But I still liked this one because of the clear blue waters that seemed to beckon to me. It was a sweltering hot day and I was more than willing to oblige. There was a rope from where you could swing and then jump into the water just like Tarzan. The falls itself had 3 levels. We hung out here for about an hour, swimming around and jumping off from the waterfalls. Salagdoong was my favorite stop in Siquijor. You can’t go to Siquijor and not drop by here. Aside from it’s gorgeous white-sand beach, it has one attraction that keeps tourists coming back. Cliff diving. There are 3 levels you can jump off from. I was able to try the first and second level. I’ll definitely come back for the third. It can be quite scary from up there but after the first jump, the adrenaline rush is like no other. You’ll keep coming back for more. Here’s our tour guide, Kuya Irvin, who brought us around the island. Siquijor is so small you can tour the entire island in about 2 1/2 hours. If you want to visit Siquijor, you can contact Kuya Irvin at 0915 890 3286. Siquijor has one of the most stunning beaches I’ve ever seen. It’s definitely a go-to summer getaway, especially for beach junkies like me! Life is too short to be spent working all the time. Enjoy your summer. Eat. Have fun. Travel! Visit Siquijor. I fell in love with Dumaguete City the moment I stepped off the boat and saw the Acacia-lined boulevard. Dumaguete City holds a lot of happy memories for me. Mainly because it’s where Silliman University is located – my alma matter. That’s why even thinking about Silliman brings a smile to my face. That’s why when we were planning our family vacation, I was so excited about visiting Dumaguete again. Silliman University was founded back in 1901,more than 100 years ago, with the help of a retired businessman and philanthropist from New York, Dr. Horace Silliman. Silliman is rich in history, art and culture. Walking through the university is akin to walking through a huge museum. It’s filled with history, stories of the past that live on through the structures that remain and the people that tell their stories. The music scene is also quite vibrant. Every February, there’s a song writing contest that Sillimanians can join in. The only requirements are first, you need to be a Sillimanian. And second, your song has to be an original composition. Luce Auditorium, a world-class auditorium, regularly holds shows such as musicals, piano concerts or ballets. And if you’re into art, then there’s an art org you can join to enhance and showcase your craft. Edith Carson Hall is one of the three all-girls dormitory in Silliman University. They also have three all boys dorms. The best thing about living here is, aside from it’s air-conditioned, it’s located right inside the campus. So you just have to walk towards your classes. Plus, it’s beside the boulevard. It’s so refreshing to wake up to the sound of waves crashing on the sea shore. You can’t visit Dumaguete and not try Bossings Tempura. It’s the best tempura ever – and that’s coming from someone who doesn’t really eat tempura. Bossings Tempura has sauces ranging from 1 to 5, with 1 being the least spicy and 5 being the spiciest. I tried this when I was a freshman. I couldn’t even finish one piece because tears started flowing out of my eyes the moment I started eating. I can only tolerate sauce number 3. It’s now open for franchise. Bossing’s Tempura currently has about 5 branches around Dumaguete City. Another thing I love about Dumaguete City is the fooood! There are so many delicious and affordable food places scattered around the city. You can really go fat from all the yummy food here if you don’t control yourself. I think almost all of us gained weight during our freshman year. Silliman truly provides a wide range of opportunities for students to grow into who they are destined to be. I’ve had a lot of great experiences in Silliman University. Even though being a student nurse wasn’t easy, my college days are filled with joyful memories. As I walked through the Acacia-lined trees of Silliman University, I couldn’t help but recall my college days. Studying on the steps of the Siliman library, talking with my dorm-mates outside Carson Hall and practicing the piano at Guy Hall. I’ve been to several colleges around the Philippines, but for me, nothing beats Silliman University. What I love most about the Philippines is the natural wonders that abound in our country. We are so blessed to have all this beauty just within our grasp. I’ve traveled around the Philippines and it still amazes me every time just how beautiful our country is. When my brother and his wife told us we were going to meet up for a family vacation in Bohol, I was psyched. Although I’ve been to Bohol several times already, it’s attractions still amaze me. Besides, I haven’t seen my brother in 3 years since they’re based in Australia. So it would be a great place for our family to bond. We took a ferry from Cebu to Bohol and upon arriving, checked in at Panglao Regents Park. The seaside of Panglao reminds me of Boracay. The restaurants along the beach, the fresh seafood, trinkets for sale on the beachfront and foot massages give off that Boracay vibe. Panglao is a lot less commercialized though. That’s a plus for me. We enjoyed our first day walking by the beach and eating. Yup. I did a lot of eating. I especially liked the Malunggay ice cream from Bohol Bee Farm. Yummy! The Chocolate Hills are one of the Philippine’s natural wonders. It’s made from limestone left over from coral reefs during the Ice Age when the island was submerged. These are one of the main tourist attractions in Bohol. We had to climb a flight of stairs to enjoy the awesome view at the top. But it’s well worth it. Tarsiers are small creatures, which you can pretty much hold in the palm of your hand. They are nocturnal animals. They sleep during the day and hunt at night. They are also territorial so you can often depend on them to stick to a certain area. Tarsiers are extreme introverts. They live alone for most of the year and only come in contact with other tarsiers around September to October to mate. The conservation area looked like a mini-forest wherein we could view the tarsiers in their natural habitat. 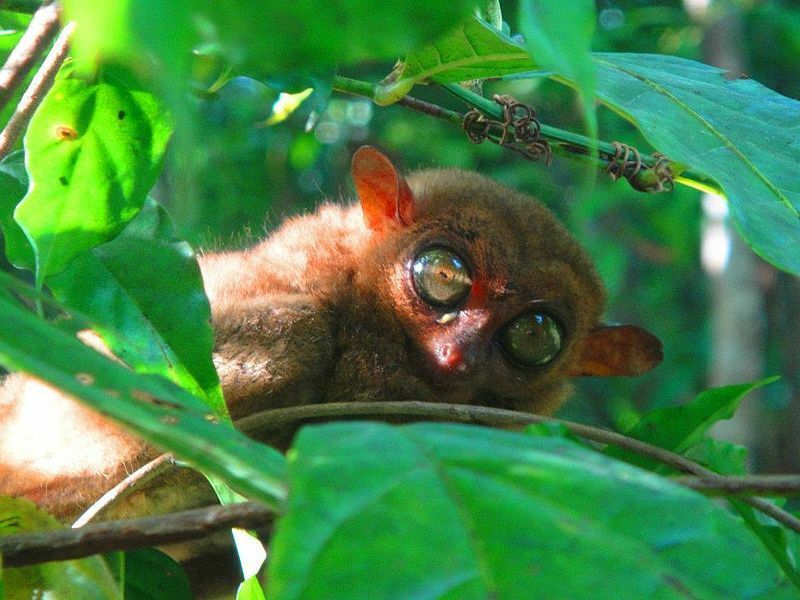 Tarsiers have been classified as an endangered species. We couldn’t touch them as constantly touching them would shorten their lifespan. Baclayon Church is a Roman Catholic church founded by the Jesuit priests Juan de Torres and Gabriel Sanchez in 1596. It’s over 400 years old and has been declared as a National Cultural Treasure by the National Museum of the Philippines. It was hit by an earthquake in 2013 and part of it was still under repair when we visited. The blood compact done in Bohol between Datu Sikatuna the chieftain of Bohol and the Spanish explorer Miguel Lopez de Legazpi is called Sandugo meaning “one blood”. It was done way back in 1565 to seal the friendship between the Spaniards and Filipinos. This was the area where this monumental event happened, 451 years ago. The Bohol Forest is a man-made mahogany forest that stretches on for 2 kilometers on the borders of Bilar and Loboc towns. I love how the trees seem to meet together forming a canopy of greenery beneath the blue sky. The Bamboo Hanging Bridge is a fun tourist attraction located in the Municipality of Sevilla. The bridge is made form woven bamboo slats and the rails are made from steel cables making it totally safe to cross. Stepping onto the bridge may seem scary at first because of all the movement it makes – especially if there are a lot of people using it. But we still had fun crossing it and I can say it’s very safe. The Simply Butterflies Conservation Center is the first butterfly livelihood breading program in Bohol. It’s aim is to protect and increase the butterfly population through breading and research. The Loboc River Cruise is one of Bohol’s most famous tourist attractions. You get to enjoy a delicious buffet of Filipino cuisine while being serenaded by local singers and while enjoying the fresh clean area of the Loboc River. This was my favorite stop because of the all the yummy food I got to eat while on the cruise. Plus we got to enjoy a cultural show by the locals in Bohol. Definitely a must-try! Our Bohol trip was so much fun! Have you visited Bohol? Feel free to share your experience here. Live a Truly Wealthy life. My friends and I went on a trip to Cambodia last 2014. Here’s a photo diary of our trip. Cambodia is rich in culture and heritage. It’s a great country to discover. On our first day, we went on a temple tour – starting with Ankor Wat – Cambodia’s biggest temple and the largest religious monument in the world. Ankor Wat was built by Khmer King Suryavarman in the 12th century as his state temple. It has become a religious center and is now the symbol of Cambodia. It’s also now a prime tourist spot in Cambodia. After Ankor Wat we visited 4 other temples. They equally interested but not as grand. I was just so sad that we weren’t able to visit the temple that Angelina Jolie filmed Tomb Raider in. Last weekend, my family and I went on a family outing to celebrate the graduation of one of my cousins. We did this by visiting the top tourists spots in Iligan City. I usually blog about my trips to other cities and countries, so it’s only right that I should blog about my hometown as well – Iligan City. My hometown is known as the City of Majestic Waterfalls. The name Iligan is from the Higaunon (Lumad/Native of Iligan) word “Ilig” which means “to go downstream”. 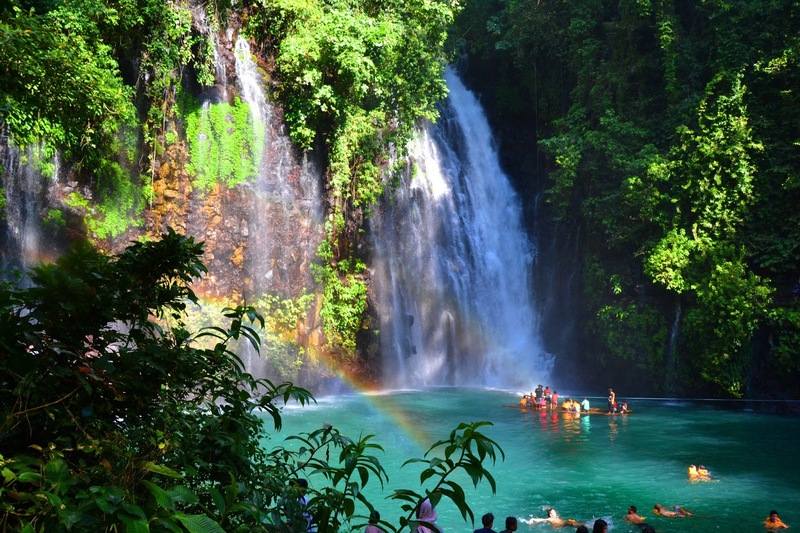 It has 23 waterfalls in and around the city, the most famous of which is Maria Christina Falls. First stop – Maria Christina Falls. This is the landmark of Iligan City and is famous for its grandeur. But aside from it’s majestic beauty, it also powers the Agus VI Hydroelectric Plant and provides a source of energy to the city. If Maria Christina were a woman, she would have both beauty and substance. Unlike some of the falls in Iligan wherein you can bath and splash around at leisure, this one is strictly for viewing purposes only. Our second stop was Mimbalut Falls. The water of Mimbalut Falls flows down a bed of large rocks forming mini waterfalls and pool beds which you can swim around in. The rocks can be quite slippery so caution is encouraged. But otherwise, it’s the perfect place for photo ops and back massages. Our third stop, Tinago Falls, is one of the main tourist spots in Iligan City. 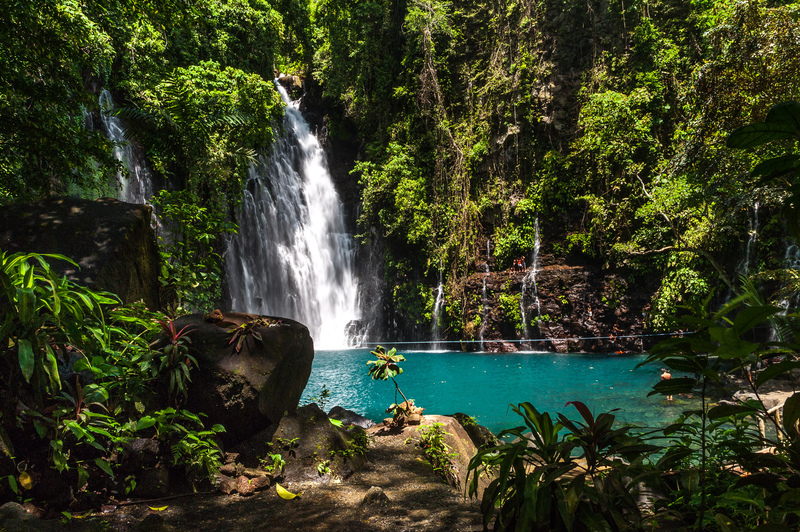 Tinago is a Filipino term which means “hidden” and is an apt name for this beauty that’s hidden in a deep ravine. Tinago falls is like a hidden gem in the midst of nature wherein you’d have to descend about 500 steps to reach it. But the effort is well worth it for Tinago Falls is a beauty to behold. Cool refreshing waters cascade down a 240 foot drop right into a bright blue basin. For the dare devils, you can also climb up the smaller falls around the basin and jump into the welcoming waters. I tried it and the adrenaline rush was just awesome! Timoga Springs, our last stop, is a cluster of cold springs located in Buru-un, Iligan City. 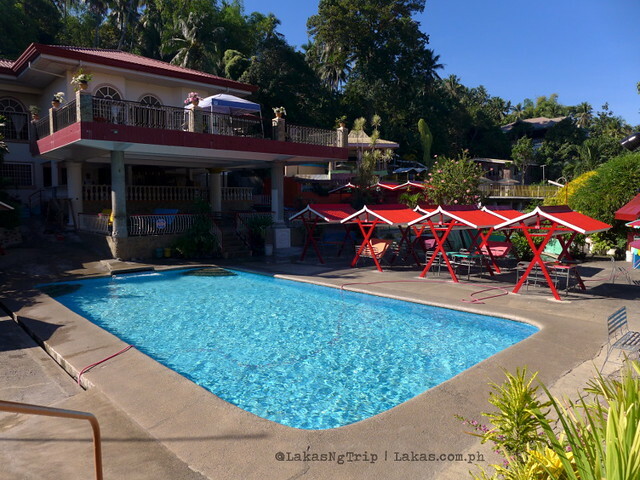 Unlike a lot of other resorts that have chlorine-filled pools Timoga is famous for its ice cold and refreshing spring water that come from Lake Lanao. The waters are so cold that it takes you a few moments to get accustomed to it. But once you’ve adjusted, you can swim around at leisure. 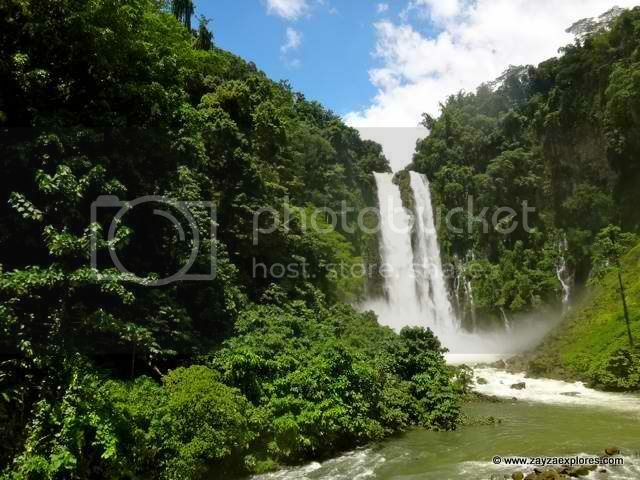 Iligan City is has many natural wonders that you can enjoy and discover. Discover Iligan today! I’ve always loved nature tripping. The world is now so connected technologically that it’s refreshing to get back to nature and enjoy what God has given us. So when my church friends invited me to go river trekking, I immediately said yes! Mintugsok Falls is located in Indahag, Cagayan de Oro. It’s a gem hidden away in the mountains. The trek takes 45 min to 1 hour and you have to pass a river and 3 small waterfalls before you arrive. It took us about an hour to get there since there were 13 of us. This part here is a bit slippery since the soil is loose. So grooved shoes or sandals really come in handy. This is the end of the mountain trail. Now,we go river trekking! But first, we enjoyed this awesome view. This is the second waterfall. (I wasn’t able to take a photo of the first one). Some of us did a few jumps here with Orwille leading the first jump. Trail leading to the 3rd waterfall. Hello waterfall number 3! We rested here a bit, did a few jumps and took more photos before proceeding to our final destination. For those who don’t know how to swim, you can enjoy a cool dip in the shallow areas of the river. 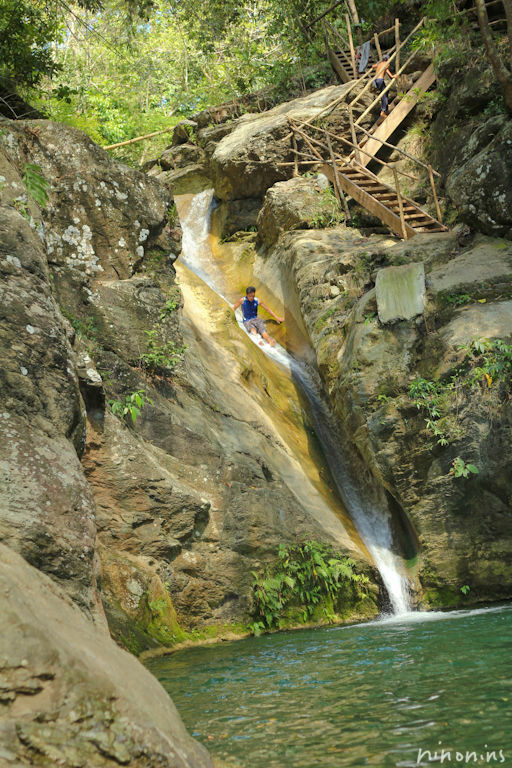 If you are more of an adrenaline junkie, you can try the sliding down the waterfall or jumping off it. Now this is experiencing life! I enjoyed the trail, the company and the food. Canned goods never tasted so good! And of course, my friend Gene’s Maja Blanca was the best! Thank you Gene! The best part was, we got to share the gospel with our new friends. We all have dreams we want to achieve and goals we want to conquer. There’s always another deal to close, client to meet or event to organize. But sometimes, we just have to step back, enjoy life and appreciate the things we have now. We enjoyed every step of our river trek experience although some areas were harder to traverse. And life is like that. Sometimes it’s hard, sometimes it’s easy, but we just have to enjoy the journey and make each moment count. Besides, there’s nothing like spending a day amidst nature to refresh ourselves. Next stop – Mt. Kitanglad! After the Midcon, we contemplated whether or not to stay in Manila or go to Tagaytay. In the end, Tagaytay won out. We got there in record time too. The drive took about 2 hours because there was no traffic. I guess everybody else stayed home because of the typhoon. We were one of the few ones crazy enough to still travel in the middle of a typhoon. I just couldn’t imagine staying in Manila and hanging out in malls. We have enough of those in Cagayan de Oro. So Tagaytay, here we come! Taaleño was the first restaurant we decided to visit since, according to Princess, it had nice ambiance and a view of the Taal Volcano. The Taal Volcano is the world’s smallest active volcano. It is the second most active volcano in the Philippines with 33 historical eruptions. The volcano which is located inside the Taal lake, would have made a picturesque view if not for the heavy fog surrounding it. The weather was so cold since it was raining non-stop outside. So we decided to try their steaming hot bulalo. I’d give it a 3 out of 5. Mushroom Burger is a small fast-food outlet in Tagaytay. And yes, as their name suggests, the patty is made from mushroom mixed with beef. Even some of their drinks had mushroom in them. Mushroom Burger started in Caloocan City back in 1978. And now, more and more people are coming to love their burgers. I don’t eat beef, and I rarely eat burgers. But I decided to try their mushroom burger just for the experience. Because we were still so full from the Bulalo, we just ordered one burger for all 6 of us and divided it. We got one bite each. 😛 Both the fries and burger tasted pretty good – considering it’s made from mushroom which I don’t really eat. It was already 6pm by the time we left Mushroom Burger. And you know what that means? Dinner time! So for dinner, Princess and Roy (our hosts) brought us to Balinsasayaw. I found the place really refreshing. Balinsasayaw is composed of one huge restaurant and a lot of small private cottages. Plus, their food was really yummy. 4 out of 5. I really like their cottages. This is perfect for lovers out on a moonlit stroll. Now what comes after dinner? Dessert of course! So after Balinsasayaw we headed to Bag of Beans for some sugar. The first time I stepped into the cafe, I already loved it! The ambiance was warm and welcoming with a rustic feel. Plus, it also had a view of the Taal Volcano. It’s the perfect place to chill in with family and friends. Bag of Beans specializes in freshly-baked breads, home-made recipe pies, well-blended drinks and aromatic freshly-brewed coffee. Their hot choco is made from real tablea. It’s the real thing. This dessert is a mix of peach and pineapple. The crust is soft and crumbly, two thumbs up. For the inside, the pineapple had the stronger flavor. We gave this a 3.5 over 5. Now this is a must try! 5 out of 5, hands down. This is the best blue berry cheesecake I’ve ever tasted. It’s even better than Bannaple’s blueberry cheesecake which is already swoon worthy <3. This one is also very good. Their crust is just amazing! Light on the tongue and it just seems to crumble in your mouth. The filling tastes great as well. I think it just needs a touch of more cinnamon to make it even better. The whole development is surrounded by pine trees and pretty, picture-perfect houses. They remind me of the candy house in Hansel and Gretel. It’s an ideal place to relax and unwind in – a far cry from the hustle and bustle of Metro Manila. By the way, this house, happens to be for sale as well! Let me know if you want more details. Tagaytay is one of the top tourist destinations in the Philippines. And now I know why. Although it was raining non-stop when we went there, it didn’t stop up from having the time of our lives. Having fun is not only about where you go but also who you are with. The people you surround yourself with – they make the difference. I’ve been to The Fort several times but it was only on my last visit that I was able to go on a major food trip with my Toastmaster friends. I think the photos speak for the themselves. Banapple is a friendly bakery cafe that serves cheese cakes, freshly baked pies and other desserts. They have delicious meals as well. In fact, their food was so good, Archie ordered two without even knowing it. For their desserts, their blueberry cheesecake is a must-try! Conti’s started out as a simple family restaurant in Paranaque. Now they have several branches including one in Fort Bonifacio, Taguig. We tried their best sellers – the Mango Bravo, Blueberry cheesecake and Bananalicious. The Bananalicious was my favorite! Dakasi is a milk-tea place that originated in Taiwan in the 1990’s. After more than 10 years, it now has several outlets all over Asia. We went there just to try Roy’s favorite milk tea flavor – chocolate milk tea. We just ordered one milk tea for all seven of us and took turns trying it out. We dropped by Gino’s not for the pizza but to try their chocolate-coated chicharon. It was certainly a different experience. It’s an explosion of different flavors – sweet, salty and spicy all at one time. Two thumbs up! The verdict: It’s much more fun to go on a food trip as a group. You can just order one or two dishes and eat it together. That way, you won’t have to finish the entire thing on your own and you’ll get to eat more kinds as well! Personally, I prefer variety over quantity. It’s just more fun that way. What about you? Do you have any food places you’d like to share with me?